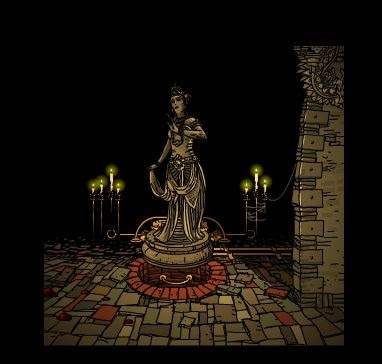 Submachine 9 The Temple the most awaited sequel to the point and click escape game series from mateusz skutnik is now here. And it's giving fans, both old and new, a mix of emotions probably a feeling of being entertained and being challenged. If you are new to this type of game, it is played entirely with the click of your mouse. Click things to interact or pick items which are to be used only in their proper place. That is where the challenge is: figuring out where to use an item and what passages it will open or what mechanism it will trigger. The game is set in a somewhat ancient and strange civilization starting off with only having a hammer and broken electronic device of some sort in your inventory. Since this one is difficult to solve, I've taken the liberty to write a guide which will thoroughly detail step by step actions to beat this game. At the beginning, right until you can't go any further. Take the brass rod that look like a spear. You will find it beside the elephant statues. Use the rod on the brass rectangle located to the left of the elephants. Go left once and go inside the now opened door. Once inside, go right until you can't go any further then take the brass jug/pitcher. Go left and left until you are outside of the structure and proceed to the fountain. In the fountain, use the jug on the fountain's faucet to fill it up with green stuff. Now that you have the jug filled with green stuff apparently called karmic water, go back into the structure. Go right twice until you get to the room where there is a brass bowl. Pour the jug into it. That green stuff will cause a magical structure growing. Put your jug back in your inventor and then click on the circular glowing object in the top middle. It's the green cog wheel. Now go left once and enter that half-dark room. Pour karmic water in the bowl so that another pattern will appear on the wall. Put the green cog wheel from you inventor in to the pattern on the wall. It will form a key-like shape. Click on the bottom of it and see to it that it animates. Holy sheep! I just realized that this is going to be very lengthy if I try to write it down so here is Submachine 9 The Temple walkthrough guide vid which shows full winning gameplay.